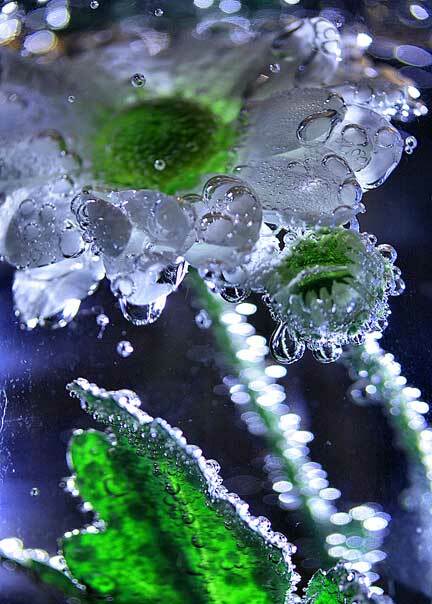 The fragile nature and beauty of colors that shimmers and swirls in soap bubbles, transient existence of bubbles of all sorts that have been captured by images in the art of photography. 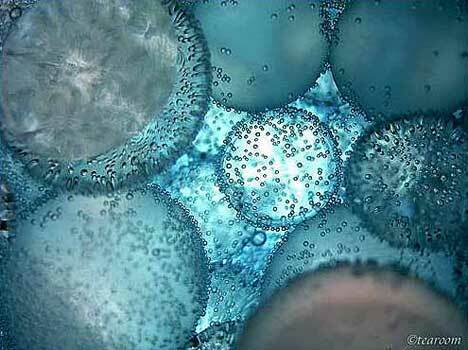 If you look closely, there are at least 3 different cameras were used to shoot the same bubble or was a collection of different bubbles. Don’t think there are cameras that can shoot that fast. I’d really like to take photos of people though, but I haven’t got around to this yet. 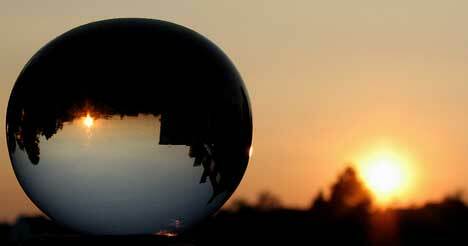 A soap bubble is a very thin film of soap water that forms a sphere with an iridescent surface, usually lasting mere moments before bursting. 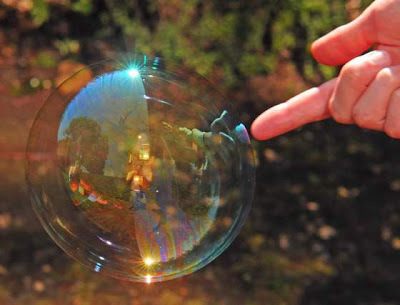 Soap bubbles can help to solve complex mathematical problems of space, as they will always find the smallest surface area between points or edges. 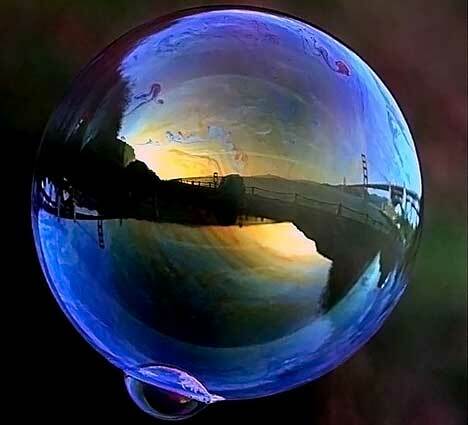 Soap bubble capturing reflection of the Golden Gate Bridge. 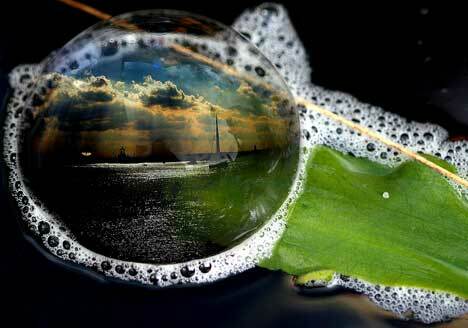 Reflection of a cloud in a soap bubble. 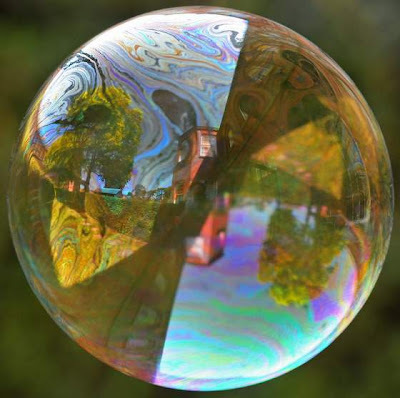 A soap bubble can exist due to the surface layer of a liquid (usually water) that has a certain surface tension which causes the layer to behave somewhat like an elastic sheet. 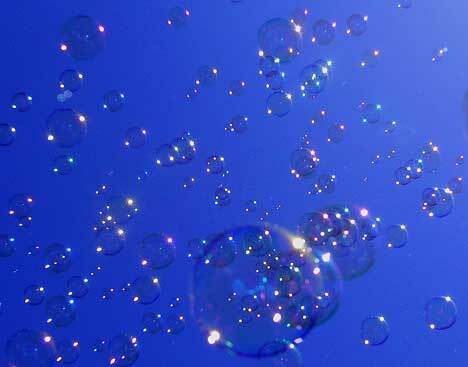 However, a bubble made with a pure liquid alone is not stable and a dissolved surfactant such as soap is needed to stabilize a bubble. 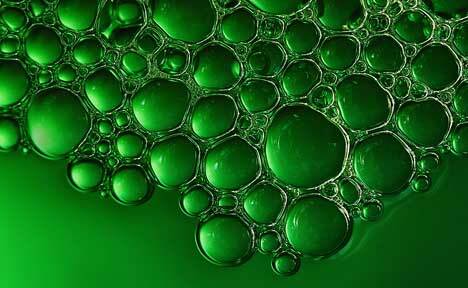 Soap does not strengthen bubbles — it stabilizes them by an action known as the Marangoni effect. 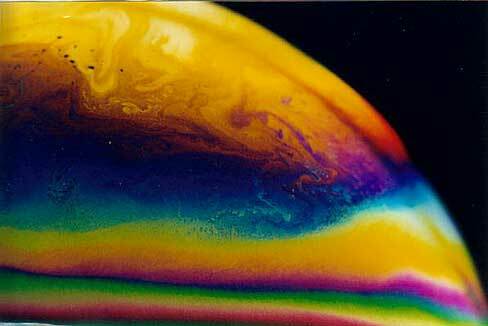 As the soap film stretches the surface concentration of soap decreases, which in turn causes the surface tension to increase. 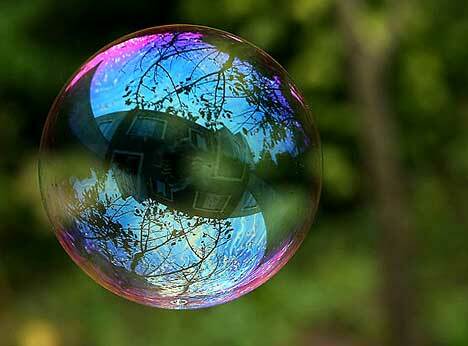 So soap selectively strengthens the weakest parts of the bubble and tends to prevent them from stretching further. 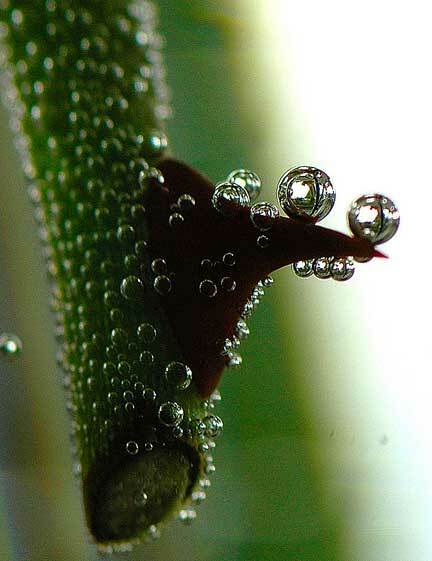 Their spherical shape is also caused by surface tension. 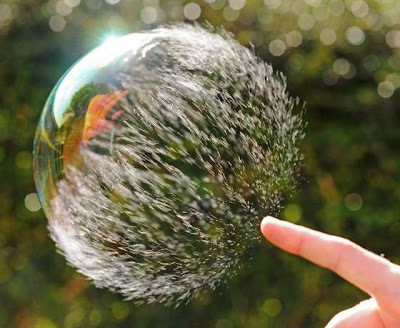 The tension causes the bubble to form a sphere, as a sphere has the smallest possible surface area for a given volume. 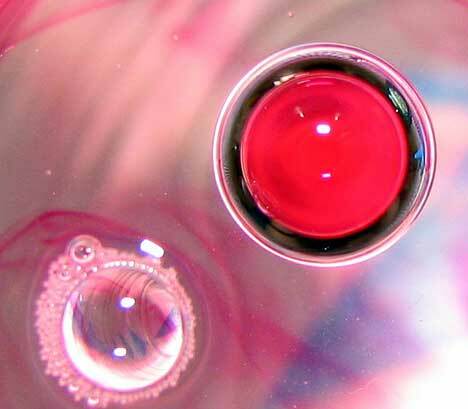 The soap reduces the water’s surface tension to approximately one third, but it is effectively doubled since the film has an inner and an outer surface. 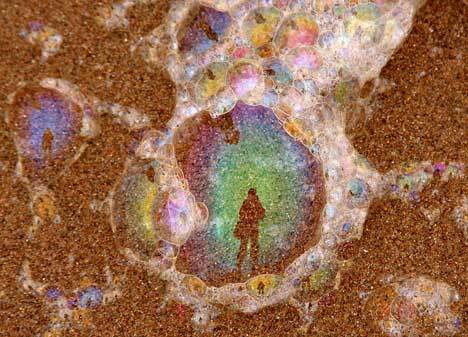 The iridescent colors of soap bubbles are caused by interfering light waves and determined by the thickness of the film. 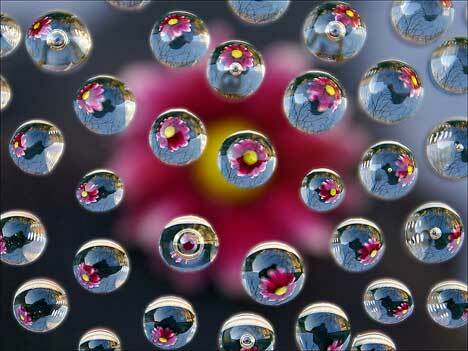 They are not the same as rainbow colors, but rather more similar to colors in an oil slick on a wet road. the film is thin and a few even thinner black spots. As light encroaches on the film, some of it’s reflected off the outer surface while some of it enters the film and reemerges after being reflected back and forth between the 2 surfaces. 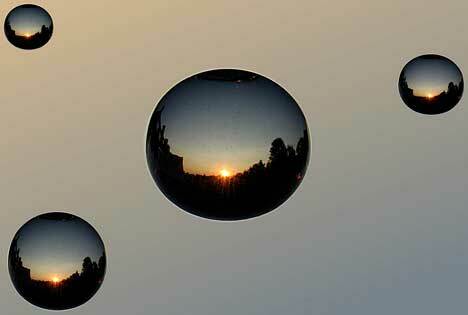 The total reflection is determined by the interference of all these reflections. 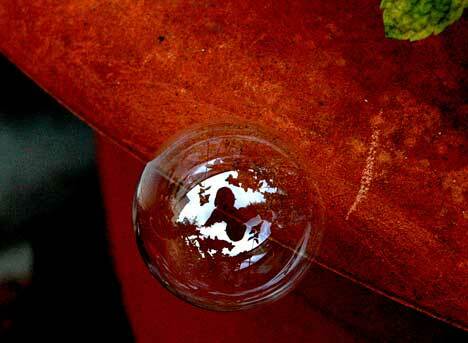 A change in color can be seen while the bubble is thinning due to evaporation. Thicker walls cancel out red (longer) wavelengths, causing a blue-green reflection. Later, thinner walls will cancel out yellow (leaving blue light), then green (leaving magenta), then blue (leaving a golden yellow). 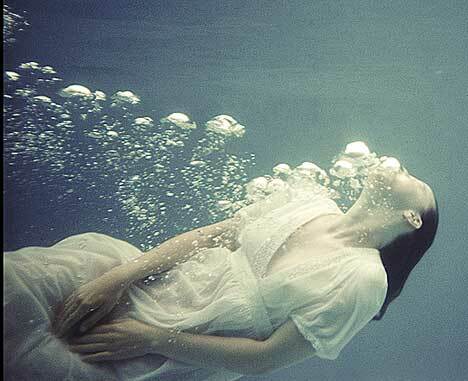 Finally, when the bubble’s wall becomes much thinner than the wavelength of visible light, all the waves in the visible region cancel each other out and no reflection is visible at all. At this point it’s probably about to pop. 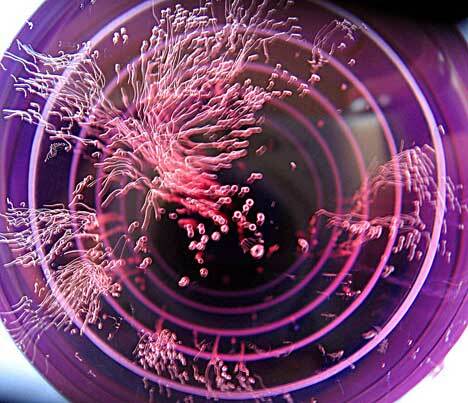 Life and death of a soap bubble. 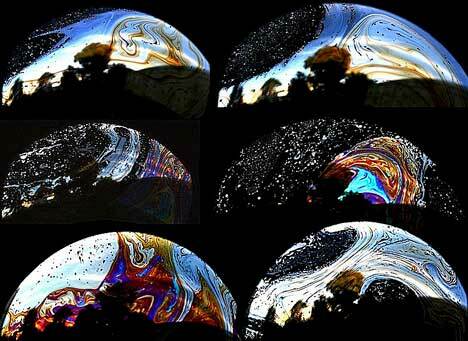 Interference effects also depend upon the angle at which the light strikes the film, called iridescence. 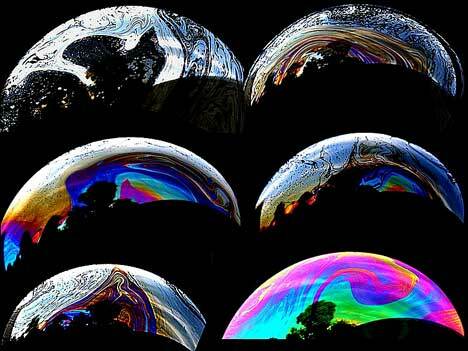 Even if the wall of the bubble were of uniform thickness, one would still see variations of color due to curvature or movement. However, the thickness of the wall is continuously changing as gravity pulls the liquid downwards, so bands of colors that move downwards can usually also be seen. 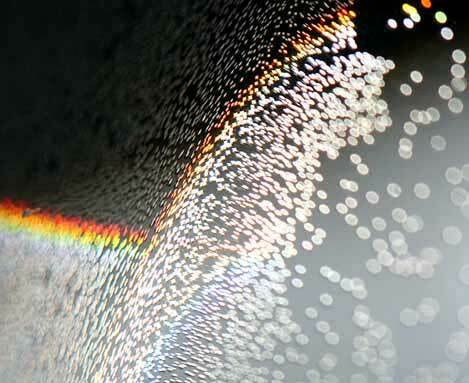 The colors are caused by Interference and reflection. 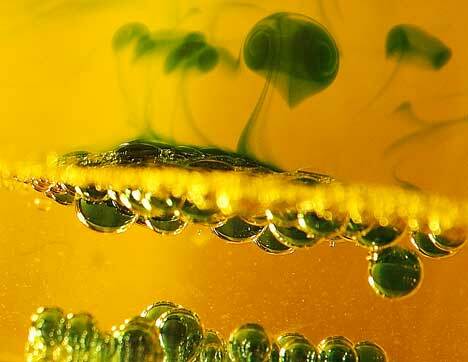 When two bubbles merge, the same physical principles apply, and the bubbles will adopt the shape with the smallest possible surface area. 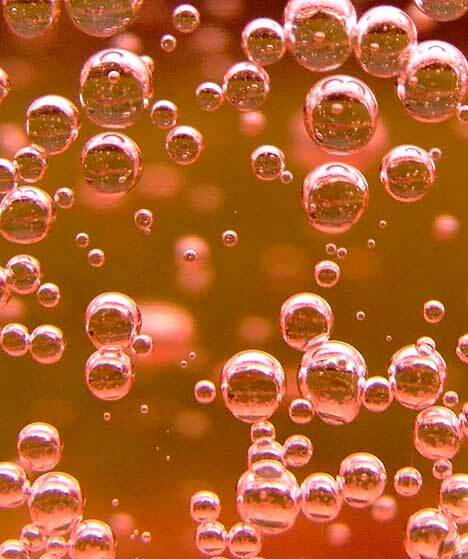 Their common wall will bulge into the larger bubble, as smaller bubbles have a higher internal pressure — known as Ostwald ripening — which is caused by pressure differences in bubbles of different radii as predicted by the Young–Laplace equation. 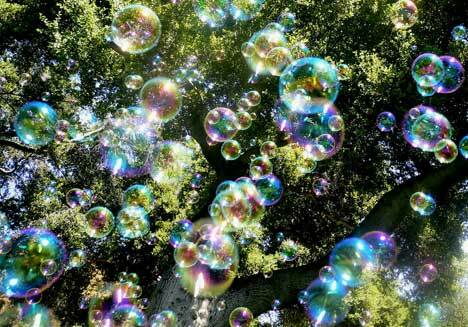 If the bubbles are of equal size, the wall will be flat. 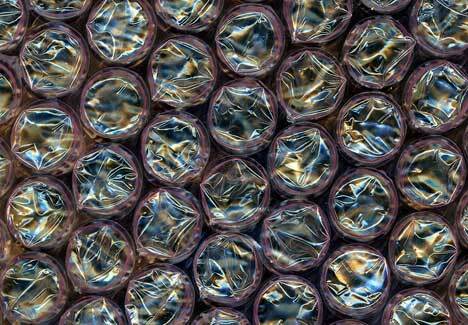 At a point where 3 or more bubbles meet, they sort themselves out so that only 3 bubble walls meet along a line. Since the surface tension is the same in each of the 3 surfaces, the angles between them must be equal angles of 120°. This is the most efficient choice, which is why the cells of a beehive use the same 120° angle which forms hexagons. 17th century Flemish paintings show children blowing bubbles with clay pipes, revealing that bubbles as playthings date back at least 400 years. The London based firm of A & F Pears created a famous advertisement campaign for its soaps in 1886 using a painting by Millais of a child playing with bubbles. 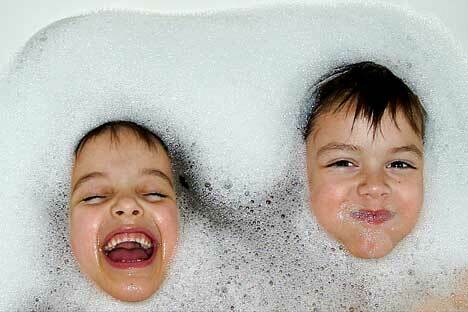 Chemtoy in Chicago began selling bubble solution in the 1940’s, captivating children ever since. According to one industry estimate, retailers sell around 200 million bottles annually, perhaps more than any other toy. 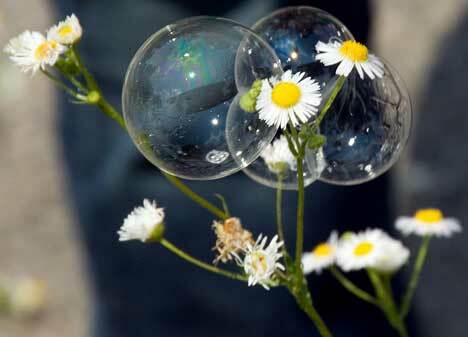 In 1984 New York architect David Stein invented the Bubble Thing to amuse his daughter. 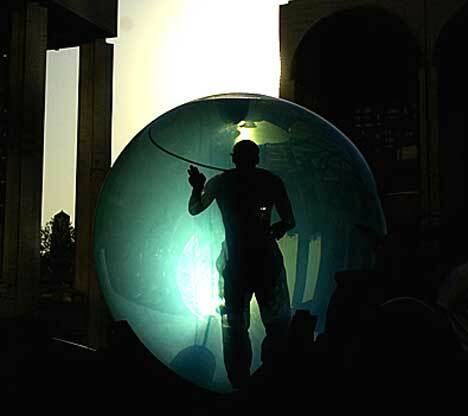 It uses a very large flexible loop of cotton fabric and a bucket of soap suds to create enormous spherical bubbles up to 8 feet (2.4 meters) in diameter and tubular bubbles 50 feet (15 meters) long and more. 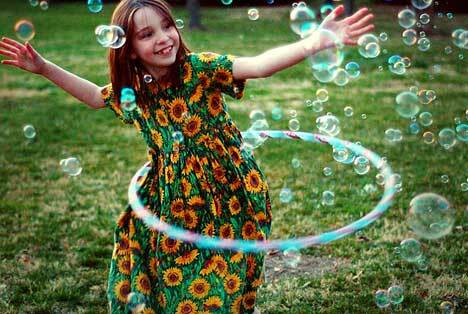 Since 1985 the Bubble Thing has been marketed worldwide by David Stein Inc and Klutz Press. 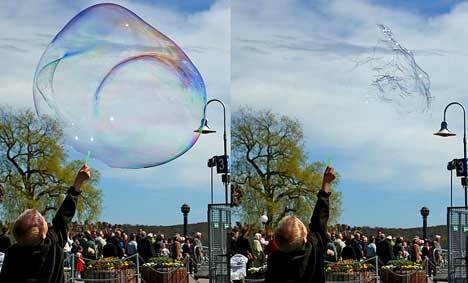 Soap bubble performances combine entertainment with artistic achievement, requiring a high degree of skill and perfect bubble suds. 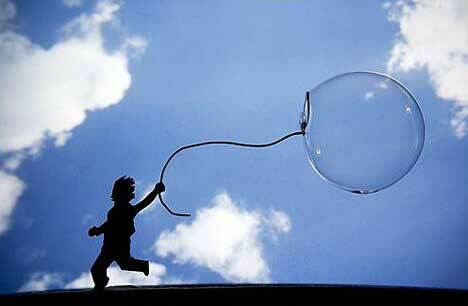 Some artists create giant bubbles or tubes, often enveloping objects or even humans. 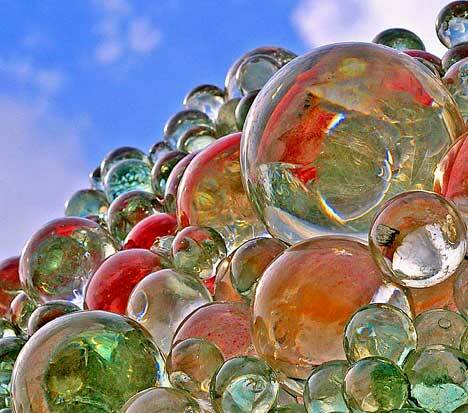 Others manage to create bubbles forming cubes and other shapes or sculptures. 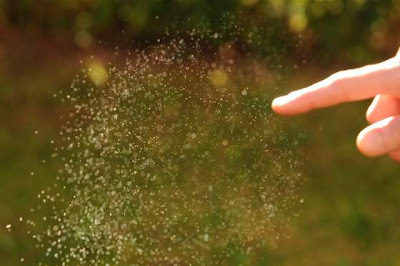 To add to the visual experience, they’re sometimes filled with smoke or helium and combined with laser lights or fire. 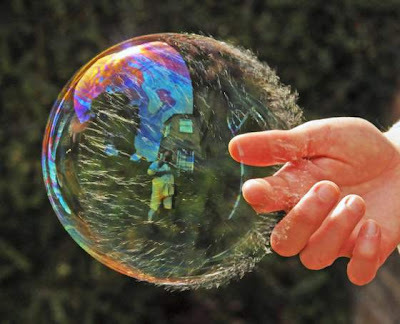 Soap bubbles can be filled with a flammable gas such as natural gas and then ignited, but this of course destroys the bubble. 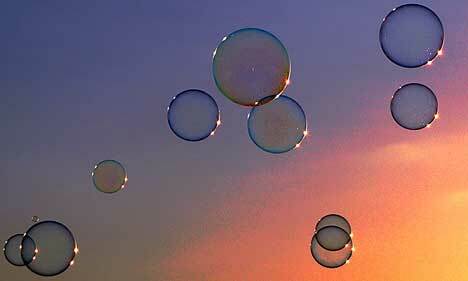 Soap bubbles blown into air below a temperature of 5 °F (−15 °C ) will freeze when they touch a surface. 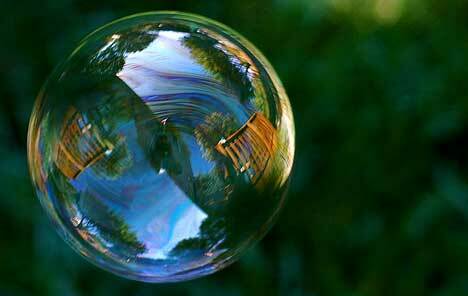 The air inside will gradually diffuse out, causing the bubble to crumple under its own weight. 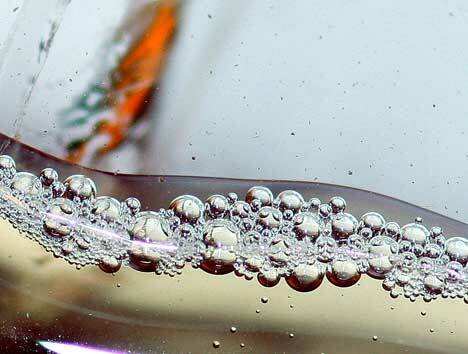 At temperatures below about −13 °F (−25 °C), bubbles will freeze in the air and may shatter when hitting the ground. 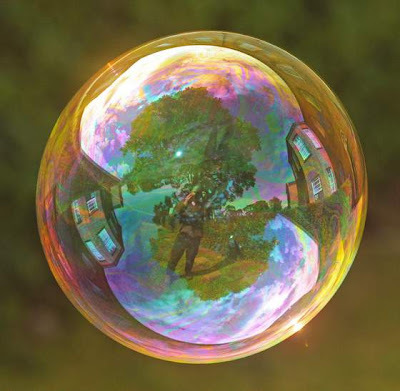 When a bubble is blown with warm air the bubble will freeze to an almost perfect sphere at first, but when the warm air cools and a reduction in volume occurs there will be a partial collapse of the bubble. It will freeze quickly and continuing to increase the bubble will shatter it. 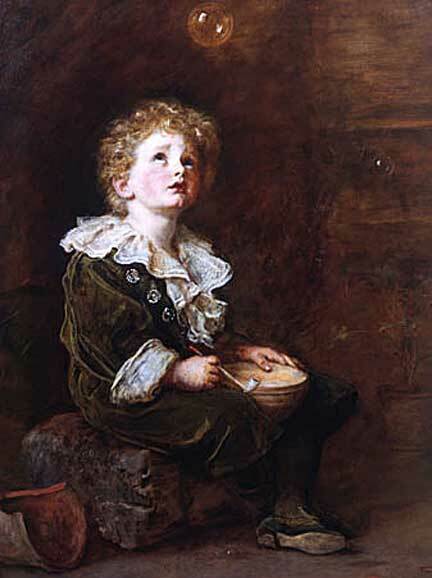 Bubbles, a painting by Sir John Everett Millais; the subject his grandson. 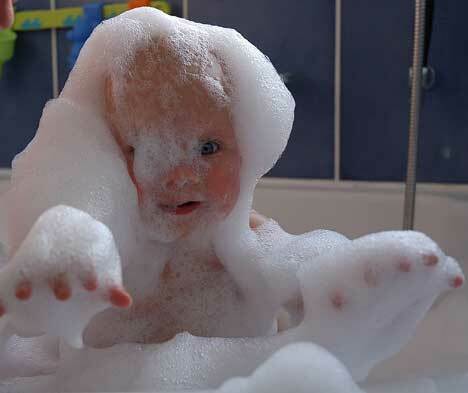 Bubbles, originally entitled A Child’s World, is a painting by Sir John Everett Millais that became famous when it was used over many generations in advertisements for Pears soap. During Millais’s lifetime it led to widespread debate about the relationship between art and advertising. It was modelled by his 5 year old grandson William Milbourne James and was based on 17th century Dutch precursors in the tradition of vanitas imagery, which commented upon the transience of life. 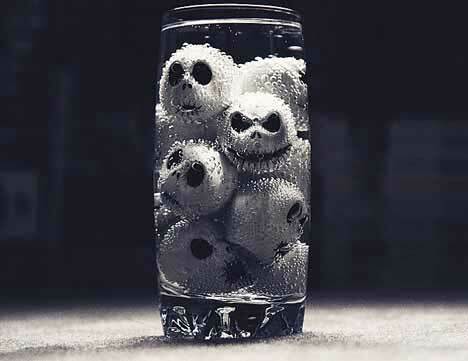 These sometimes depicted young boys blowing bubbles, typically set against skulls and other signs of death. The painting portrays a young golden-haired boy looking up at a bubble, symbolising the beauty and fragility of life. On one side of him is a young plant growing in a pot, and on the other is a fallen broken pot, emblematic of death. 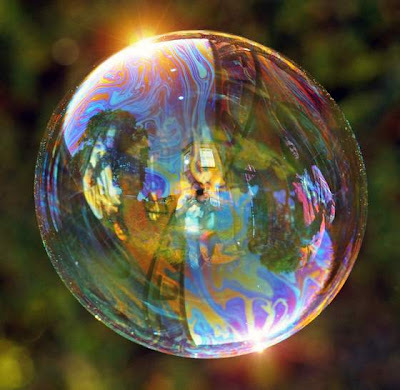 An antibubble is a droplet of liquid surrounded by a thin film of gas, formed when liquid drops or flows turbulently into the same or another liquid. 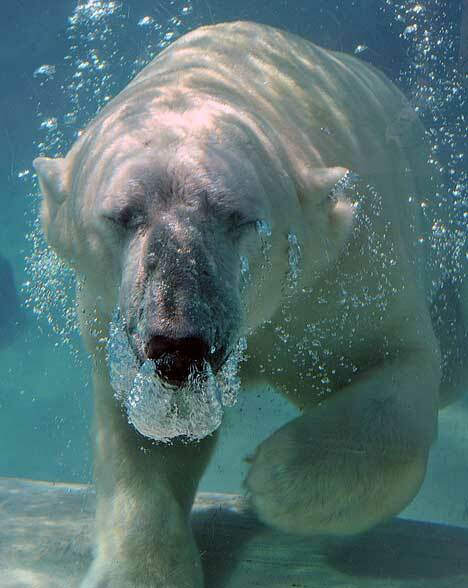 They can either skim across the surface of a liquid such as water, or they can be completely submerged into the liquid. 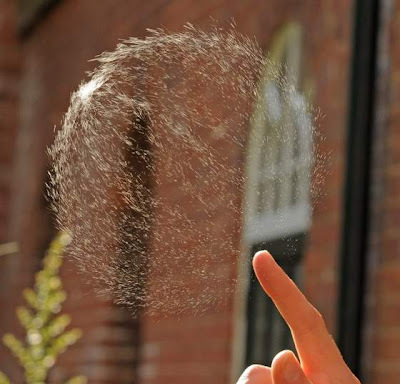 Antibubbles are a common but widely unrecognised phenomenon, in part because of their resemblance to air bubbles, and in part because of their typically transient nature. 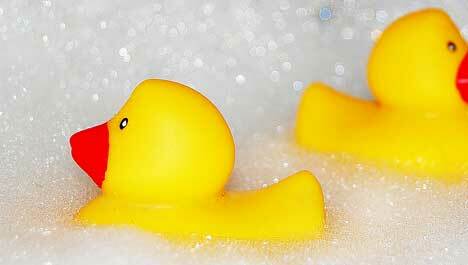 With certain soapy solutions they can be made to last much longer. 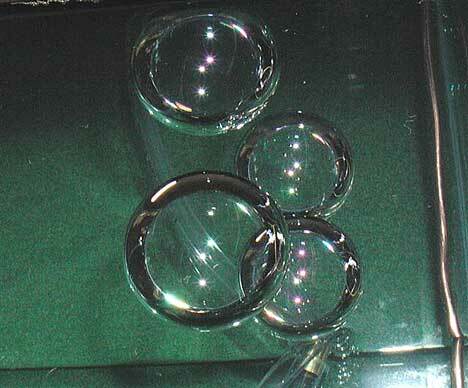 • Antibubbles are held in place by surface tension, and move rapidly across the surface of the water. 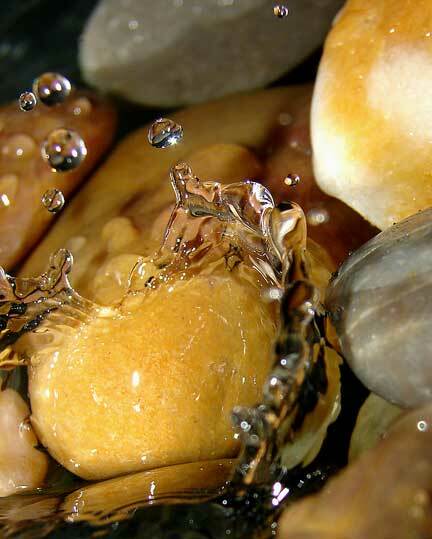 They can also be seen to ricochet off other objects in the water (such as air bubbles) and off the sides of a container in a manner similar to that of billiard balls. 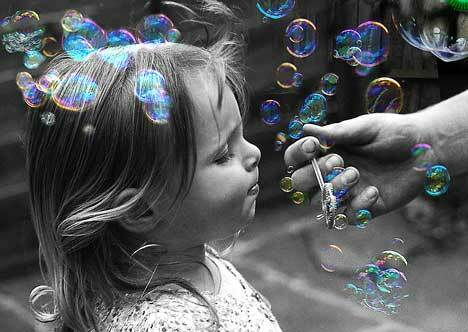 • Under ordinary circumstances, antibubbles are short-lived. 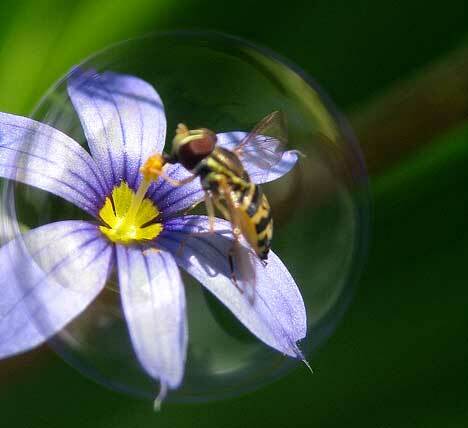 An air bubble with a soap skin may last several minutes. 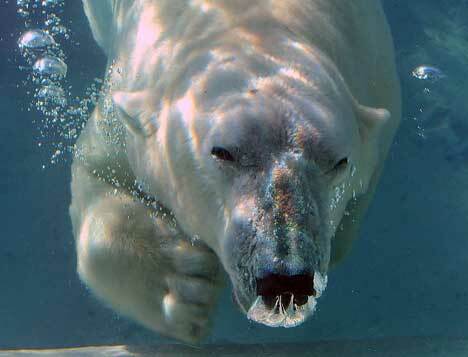 They frequently have lifetimes of a few seconds or less. 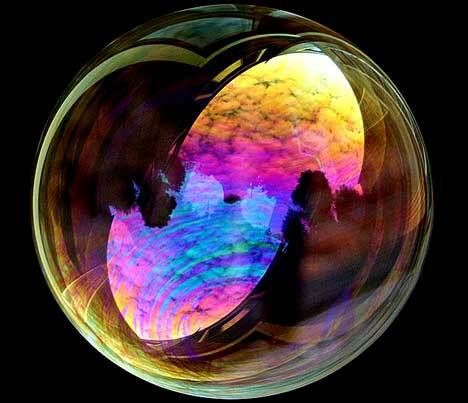 • Antibubbles refract light in a different manner than air bubbles — light entering them is refracted back toward its source in the same manner as rainbows are produced, and have a bright appearance. You can easily create them by allowing a tap to drip into a container of water to which a drop or two of soap has been added. 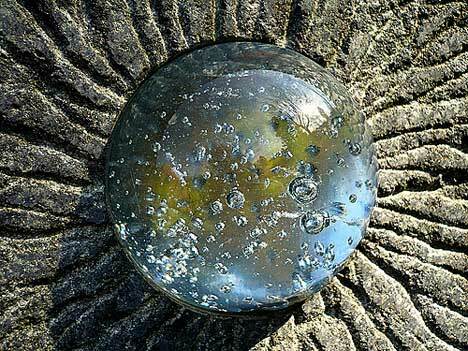 The soap reduces the water’s surface tension and allows the skin of air surrounding the droplet to remain in place for more than just a fraction of a second. 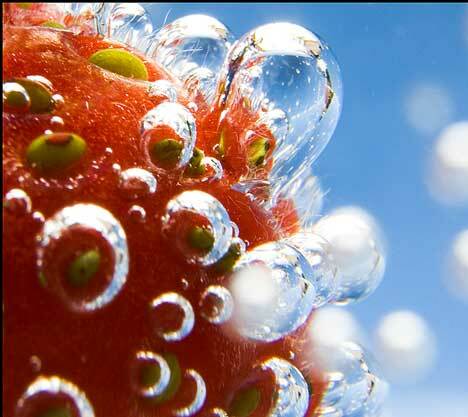 Using a drinking straw to drop droplets of sugar solution onto soapy water will produce antibubbles that sink. 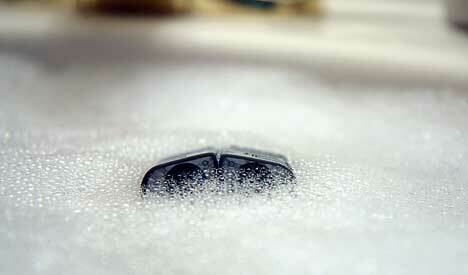 Antibubbles usually pop when they touch the bottom or the side of the vessel containing the liquid. This can be prevented by tipping a few teaspoons of sugar into the soapy water and giving it some time to dissolve (but without stirring it). Made this way they can last for several minutes. 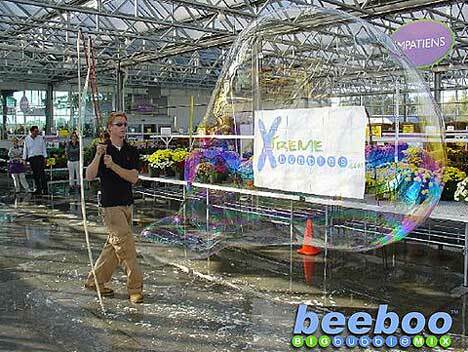 The “World’s Largest Free Floating Soap Bubble” made the Guinness World Records on October 9, 2005, measuring 105.4 cubic feet — if filled with water it would hold 788 gallons and weigh 3.2 tons. 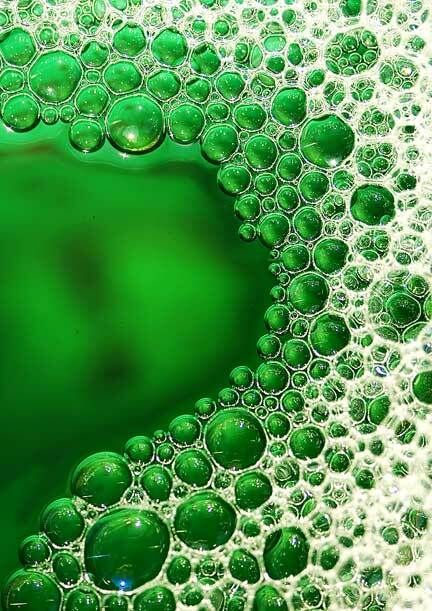 The largest bubble ever blown to make the Guinness World Records was created by David Stein of New York — a whopping 50 feet by 2 feet in diameter (15 by .6 meters) in 1998. 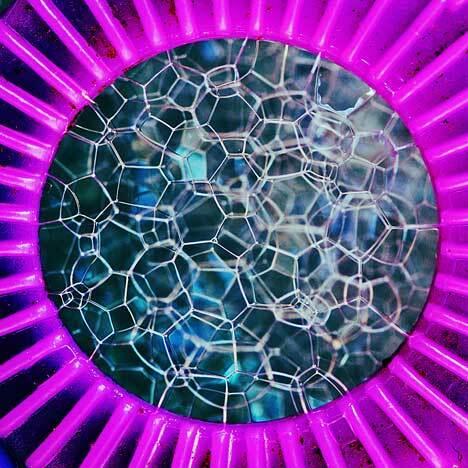 The world’s largest bubble wall is credited to Fan Yang of Mississauga, Ontario, Canada at 156 feet (47.4 meters) long and 13 feet high with a surface area of about 4000 square feet (370.4 sq meters) on August 11, 1997, at the Pacific Science Center in Seattle, Washington. 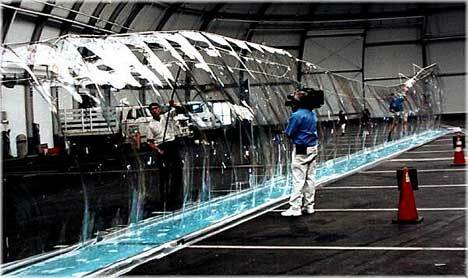 Fan Yang also holds a World Record on April 12 2006 by linking 15 pairs of people in a ‘bubble cage’ at the Discovery Science Center in Santa Ana, California. 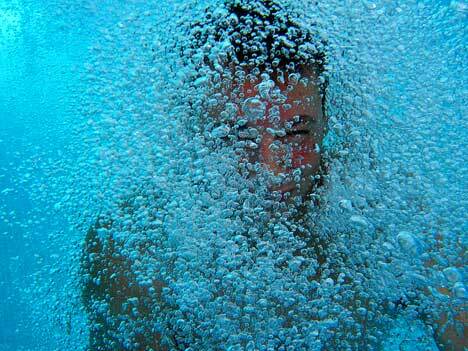 The world record for the most people inside a bubble was burst by Sam Heath a.k.a. 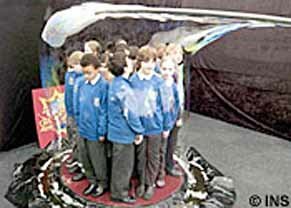 “Sam Sam the Bubble Man” at Chessington World of Adventures outside London in Surrey, UK on March 27 2006, using a 23 foot (7 meter) wand to encapsulate 19 children over 5 feet (1.5 meters) tall, standing upon a 60 inch (152 centimeter) wooden platform. 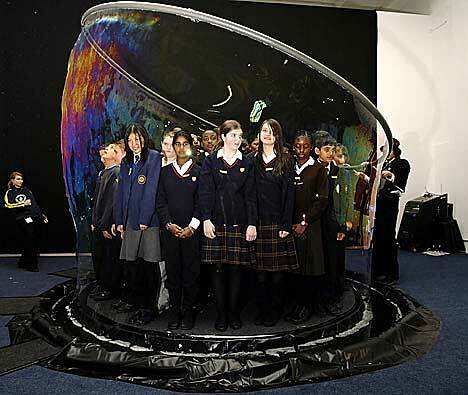 It took a mere few seconds for ‘bubbleologist’ Sam Heath to encase 50 children in an iridescent, glistening bubble of soap and water to break his own Guinness World Record at the Science Museum in London at 11 feet (3.3 meters) across and more than 5 feet high. He dipped a metal wand hoop with a 36 foot (11 meters) circumference into the solution before raising it above their heads. 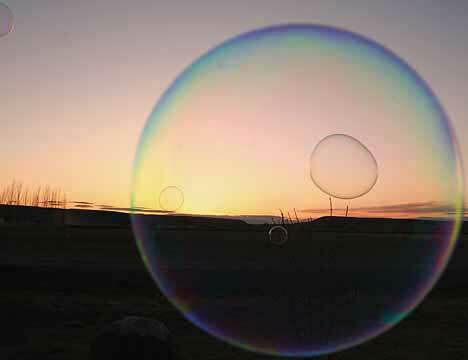 The largest bubblegum bubble ever blown was 23 inches (9 centimeters) in diameter by Susan Montgomery Williams of Fresno, California, set on July 19 1994, to make the Guinness World Records. 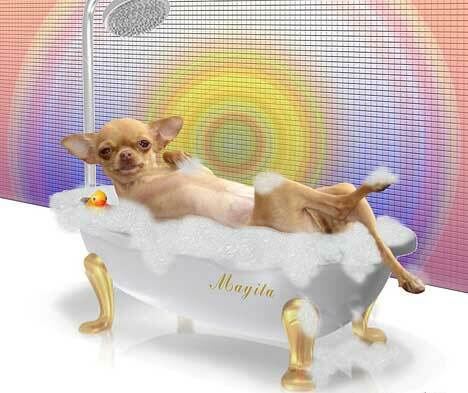 Wow that is comprehensive on bubbles. Really good study. 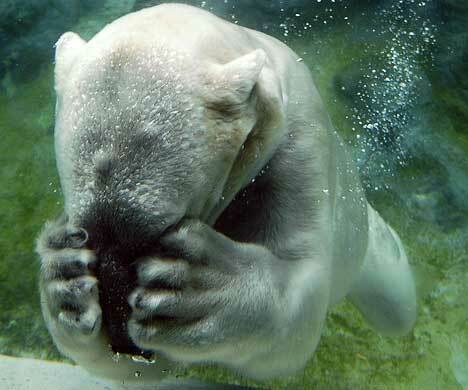 I look the reflections!